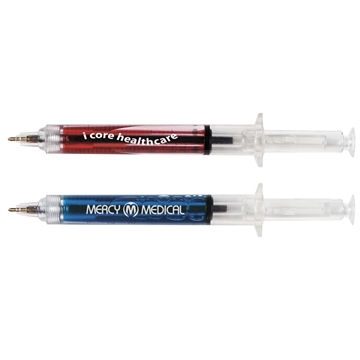 This clever black ink pen in the shape of a syringe is a fun gift for a variety of healthcare events. Choose from either blue or red liquid. Click top of plunger to expose pen point; release with side tab. Shelf life: Approximately six months. All of our clients are happy with receiving this product. I'd recommend the product. It has a professional impression and is affordable. I'd give about 5 stars to the imprint. I liked the entire product and processed to my specifications. the printing looked nicer than I expected. For the price, I am happy with the product. We were very happy with the product and also very happy with the ordering proces. AnyPromo makes it easy for me to order, come up with products via the email with specials and communicate with your company. AnyPromo is great to work with.